The genus Dispholidus has only one species (D. typus). The name ‘boomslang’ is Afrikaans for ‘tree snake’. The snake is usually found in trees and shrubs, hence the name boomslang. The Afrikaans name has also been adopted as the official English name of this snake. A boomslang is a slender snake with large eyes on a large blunt head that is distinct from the neck. The snake can grow to up to 2 meters long, but is on average about 1 to 1.6 m in length. The large eyes of the snake are characteristic of the species. Males have a variety of colour shades from solid bright green to rust-red or a combination of black and yellow. Females have a dull olive-brown or grey colour. Juveniles are quite spectacular with bright emerald eyes, white throat and cryptic, twig-coloured bodies. The boomslang use their muscles and scales to move between trees, shrubs and the ground. The boomslang is endemic to sub-Saharan Africa. It is found in South Africa, Swaziland, Mozambique, Botswana, Namibia and north through sub-Sahara Africa. 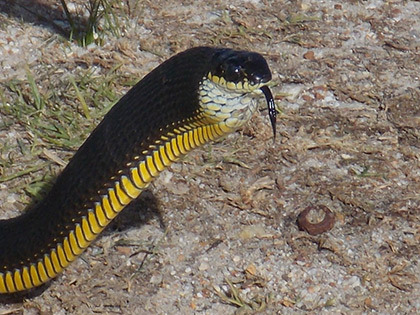 In South Africa, this snake can be found in the Western Cape, Eastern Cape, KwaZulu-Natal, Mpumalanga, Limpopo, northern Gauteng, North West and adjacent parts of eastern Free State and Northern Cape. 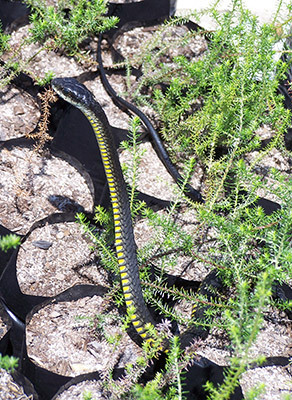 This snake is usually found in trees and shrubs in the Karoo shrub, arid savanna, moist savannah, lowland forest, grassland and fynbos vegetation types. The only time the snake is found on the ground is when it is basking or searching for food. It may also take refuge underground when the weather is harsh. The boomslang is diurnal (active during the day). The snake feeds on birds, nestlings, frogs, lizards and occasionally on small mammals. During breeding season the female will leave a scent trail for males. Males will engage is sparring matches with other males and the winner will receive the right to mate with prospective females within the area. The loser will slither off in search of other potential breeding grounds. The victorious male will follow the scent trail to the female and once he reaches her, he will inspect her. Once the male is satisfied, he will twist his tail beneath hers and copulation takes place. The boomslang is oviparous, meaning that it lays eggs. The female’s gestation period is approximately 60 days. She can lay 8–27 soft-shelled eggs the size of a ping pong ball during late spring to mid-summer. To prevent the eggs from drying out, she will lay her eggs in a damp location. This location may be a tree hollow or down a rodent burrow. The eggs will remain in the damp location for about 65 to 100 days before hatching. The babies are about 20 cm long when they hatch and they will shed their skin for the first time within 10 days of hatching. Don’t let the babies’ pretty faces fool you; they are born equipped with fangs that can deliver lethal doses of venom. Some people might think that the boomslang doesn’t have any natural enemies because it a predator. Well contrary to this notion, the snake is prey to predator birds and other snakes. Some small birds such as the bulbuls may also mob the snake if they feel threatened by it. The varied body colouration of the snakes enables it to use the cover of trees and shrubs to stalk prey without being detected. When food is detected, the snake will freeze, move its head from side-to-side and then swiftly attacks the prey. By freezing and moving the head from side to side, the snake mimics vegetation branches that are moved from side-to-side by wind, lulling the potential prey into ignoring the snake. The boomslang’s big eyes enable it to hunt during the day. When provoked or threatened, the boomslang will inflate its neck to twice its size to appear larger and expose the bright skin between the scales. If the threat still persists, then the snake will not hesitate to strike. The snake is equipped with back-fangs that inject deadly venom. The snake’s deadly bite is used for killing prey and protecting itself against threats. The boomslang’s venom is haemotoxic, which means that it affects the blood-clotting function of the victim, causing internal and external bleeding. The boomslang is equipped with a fork-tip tongue, which is used to collect particles in the air and deposit them on a special organ called the ‘Organ of Jacobson’, found in the mouth. This special vomeronasal organ detects pheromones and other chemical signals, and is used to determine what is present within the snake’s immediate environment. The snake is a biological controller. It controls the population of birds, frogs, lizards and small mammals. The boomslang is shy and very seldom bites; however, it can deliver a lethal bite if threatened. People might think that the fact that this snake is back-fanged means that it is unlikely to bite someone. Well this is untrue! This snake is able to open its mouth as wide as 170 degrees making it easy for it to bite its victim with the back-fangs. Most people who have been bitten by this snake are snake handlers and park attendants. The venom is so potent that even a scratch could cause serious symptoms. The snake’s haemotoxic venom is slow-acting and may take 24–48 hours to produce serious symptoms. Symptoms include internal and external bleeding, headaches, nausea, sleepiness and mental disorders. Here are a few first-aid procedures to follow if someone is bitten by a boomslang: (1) Immobilise the victim. The victim must lie down and keep as quite as possible. (2) Apply a pressure bandage immediately and immobilise the limb with a splint to reduce the spread of venom. (3) Loosen the bandage if there is severe swelling but do not remove the bandage. (4) Take the victim to the nearest hospital. Anti-venom is available at the South African Vaccine Producer (formerly South African Institution of Medical Research). 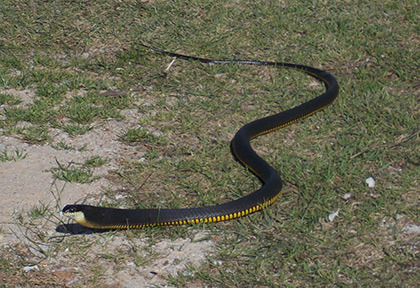 Some people believe that if you walk past a bush or beneath a tree in which a boomslang is present, the snake will bite you in the face or drop onto your head to bite you, and if you park your car with the windows open near such a bush or tree, the snake will take refuge in your vehicle. The first belief is purely derived from the fear that people have. However, the second situation has happened at the Harold Porter National Botanical Garden; but luckily no one was harmed.In general snakes do not attack stationary objects and they never chase after humans. Bird aviaries near human housing may attract the snake and bring it into contact with humans. The conservation status of the boomslang in South Africa is Least Concern. Four subspecies (D. t. typus, D. t. viridis, D. t. kivuensis, D. t. punctatusI) were recognised, however, three of the subspecies where considered invalid. This genus is being revised. The boomslang is often confused with black and green mambas, rufous–beaked snakes, and harmless green snakes of the genus Philothamnus. Marais, J. 1999. Snakes and snake bite in southern Africa. Struik, Cape Town. Marais, J. 2014. Dispholidus typus In: Atlas and Red list of Reptiles of South Africa, Lesotho and Swaziland. ed Michael F. Bates, W. R. Branch, A. M. Bauer, M. Burger, J. Marais, G. J. Alexandre & M. S. de Villiers. Suricata 1. South African National Biodiversity Institute, Pretoria. Pp. 414. Branch, B. 2001. A photographic guide to snakes and other reptiles of southern Africa. Struik, Cape Town.